The Miracle Mile has grown over the past 14 years, but it will be again held on the Rehoboth Boardwalk this year. Join Arline, cancer survivors, and caregivers on Saturday, June 3, to celebrate your “grit and grace” during the one-mile walk, which honors National Cancer Survivor Day. We also encourage you to invite those who have supported you on your cancer survivorship journey. Participants will gather and register at All Saints’ Church on Olive Avenue, and from there proceed to a walk along the boardwalk. Participants are invited to return to All Saints’ following the walk for a complimentary, hot breakfast and fellowship. More than 100 people take part in the annual event, which brings together cancer survivors, caregivers, relatives and friends. Registration begins at 7:30 a.m. T-shirts will be given to survivors. The walk begins promptly at 8 a.m. Register online: https://miraclemile2017.eventbrite.com. You can also register by calling Tunnell Cancer Center at (302) 645-3100, Ext. 2718. 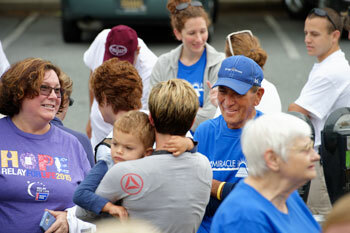 Photo Caption: Past year Miracle Mile participants gather in camaraderie and support.